Man Ray was an American visual artist who spent most of his career in France. He was a significant contributor to the Dada and Surrealist movements, although his ties to each were informal. He produced major works in a variety of media but considered himself a painter above all. Our Fine Art Gallery has the finest quality Man Ray original prints. We have a large inventory available off-site and we encourage you to make an appointment to see specific works you are looking to collect. We are happy to meet you at either our art gallery showroom or at your home or office for a private presentation. Born Emmanuel Rudnitzky, visionary artist Man Ray was the son of Jewish immigrants from Russia. His father worked as a tailor. The family moved to Brooklyn when Ray was a young child. From an early year, Ray showed great artistic ability. After finishing high school in 1908, he followed his passion for art; he studied drawing with Robert Henri at the Ferrer Center, and frequented Alfred Stieglitz’s gallery 291. It later became apparent that Ray had been influenced by Stieglitz’s photographs. He utilized a similar style, snapping images that provided an unvarnished look at the subject. Ray also found inspiration at the Armory Show of 1913, which featured the works of Pablo Picasso, Wassily Kandinsky and Marcel Duchamp. That same year, he moved to a burgeoning art colony in Ridgefield, New Jersey. His work was also evolving. After experimenting with a Cubist style of painting, he moved toward abstraction.In 1914, Ray married Belgian poet Adon Lacroix, but their union fell apart after a few years. He made a more lasting friendship around this time, becoming close to fellow artist Marcel Duchamp.In 1915, Man Ray met French artist Marcel Duchamp, and together they collaborated on many inventions and formed the New York group of Dada artists. In 1921, Ray moved to Paris and became associated with the Parisian Dada and Surrealist circles of artists and writers. 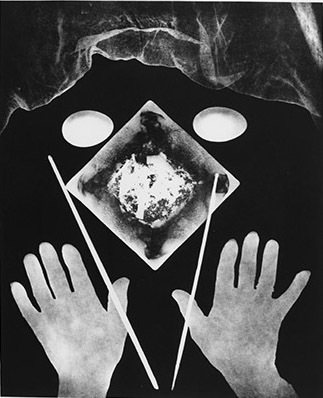 His experiments with photography included rediscovering how to make “camera-less” pictures, which he called rayographs. Along with Duchamp and Francis Picabia, Ray became a leading figure in the Dada movement in New York. Dadaism, which takes its name from the French nickname for a rocking horse, challenged existing notions of art and literature, and encouraged spontaneity. One of Ray’s famous works from this time was “The Gift,” a sculpture that incorporated two found objects. He glued tacks to the work surface of an iron to create the piece.In 1921, Ray moved to Paris. There, he continued to be a part of the artistic avant garde, rubbing elbows with such famous figures as Gertrude Stein and Ernest Hemingway. Ray became famous for his portraits of his artistic and literary associates. He also developed a thriving career as a fashion photographer, taking pictures for such magazines as Vogue. These commercial endeavors supported his fine art efforts. A photographic innovator, Ray discovered a new way to create interesting images by accident in his darkroom. Called “Rayographs,” these photos were made by placing and manipulating objects on pieces of photosensitive paper.One of Ray’s other famous works from this time period was 1924’s “Violin d’Ingres.” This modified photograph features the bare back of his lover, a performer named Kiki, styled after a painting by neoclassical French artist Jean August Dominique Ingres. In a humorous twist, Ray added to two black shapes to make her back look like a musical instrument. He also explored the artistic possibilities of film, creating such now classic Surrealistic works as L’Etoile de Mer (1928). Around this time, Ray also experimented with a technique called the Sabatier effect, or solarization, which adds a silvery, ghostly quality to the image.Ray soon found another muse, Lee Miller, and featured her in his work. A cut-out of her eye is featured on the 1932 found-object sculpture “Object to Be Destroyed,” and her lips fill the sky of “Observatory Time” (1936). In 1940, Ray fled the war in Europe and moved to California. He married model and dancer Juliet Browner the following year, in a unique double ceremony with artist Max Ernst and Dorothea Tanning.